To call Pakicetus (pitctured below) a "whale" defies intuition. Between three and six feet in length, with four legs, fur, and a long snout, the roughly 48 million-year-old mammal looks more like a dog than, say, a minke whale. But the evolutionary descendants of this long extinct creature have far more in common with the giants of the sea than the canines in our homes. The giveaway is the skull. A bony wall surrounds the ear region in Pakicetus, just like it does in all living whales. The resemblance is uncanny, a likeness distinct from all other mammals. An ancient whale originally unearthed in 2011 also bears the hallmark skull of its evolutionary relatives. Now, eight years later, it has been officially entered into the scientific record. As described by its discoverers from the Royal Belgian Institute of Natural Sciences in a paper published to Current Biology, Peregocetus pacificus is the first indisputable four-legged whale that swam in the Pacific Ocean. 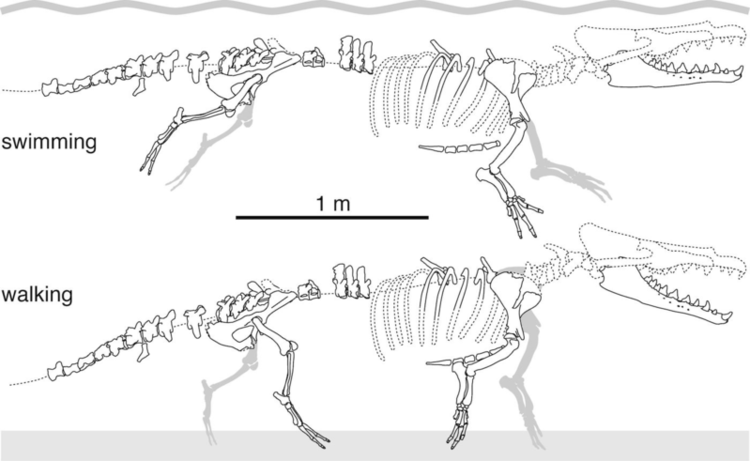 Fossils of the earliest whales, those still sporting four legs, have almost exclusively been found on the Indian subcontinent. Peregocetus pacificus was dug up in Peru, on the other side of the planet! Lead author Olivier Lambert and his colleagues speculate that P. pacificus and its ancestors might have reached the western shores of South America traveling first around Africa, then to the southern tip of South America, before finally turning north. Schematic drawings of the articulated skeleton of P. pacificus showing the main preserved bones, in a hypothetical swimming and terrestrial posture. P. pacificus fittingly means "the traveling whale that reached the Pacific." It both walked and swam the planet roughly six million years after Pakicetus, around 42 million years ago. At least twice the size of its ancestor, P. pacificus was more adapted to water than land, and likely would have propelled itself similarly to modern otters, the authors say. It might have looked the part as well, potentially sporting a paddle-like tale, webbed feet, and whiskers. In the 15-million-year saga of how whales lost their legs, P. pacificus would have shown up somewhere in the middle of the story. Six million years later, descendants like the mighty Dorudon swam the seas, with its forelimbs transformed to flippers and its hindlimbs reduced to nubs. A few million years later, living whales showed no outward signs that they ever walked on the surface of the Earth.